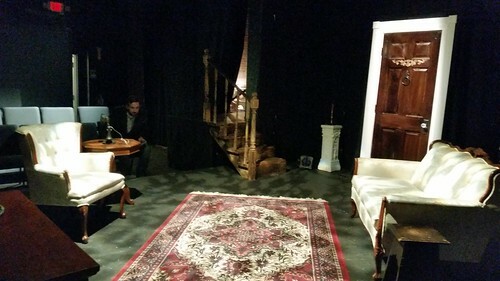 The set for Salem Theatre Company's "The Thing on the Doorstep". I'm a big fan of H. P. Lovecraft--of his writing that is, not so much of worldview point. I'm currently slowly making my way through his entire works (a project for next year actually). So when I saw that Salem Theatre Company was putting on "The Thing on the Doorstep"--a short story adapted into a play, I was quite excited and intrigued about the performance. For those that aren't familiar with Salem Theatre Company, they operated out of a small and intimate space on Lafayette Street that often surprised people when they first walk in. It seats maybe 40-50 people and they play around with how they might present the stage. In this case, they split the stage between the audience, with seats where I was standing taking the picture and seats on the far side (in the upper left quadrant of the photo). The adaptation was curiously done. Overall, well acted and largely well adapted, though there was a strand of plot about the protagonist's wife being a suffragette, which seemed more about attempting to undo Lovecraft's sexist legacy than having much to do with the actual plot, but it all worked for someone who hadn't read the story. The biggest delight for me was that two of the actors (there were five in total), were former students of mine from when I taught at Salem State University.